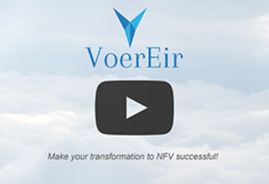 VoerEir was founded mid 2015 by a team of former Ericsson executives with a clear mission to help mobile operators succeed with their NFV transformation. All members of the team came with several years of experience from Ericsson's NFV-Infrastructure development and VNF onboarding projects and had come to the conclusion that key for a successful NFV transformation, is to take control over the NFV-Infrastructure's essential Key Performance Indicators (KPIs). Since the start VoerEir has focused on finding and defining these KPIs and developing our own market leading Test automation system for all phases in an NFV-Infrastructure's life cycle. VoerEir already has a list of customers, including several Tier 1s, for both the Touchstone product, launched in Q3 2016 and for consulting engagements. The full VoerEir team has many years of experience from OpenStack, NFV, Telecom application development and VNF onboarding. We continue to upgrade our knowledge base through industry cooperation, open source community engagement, cooperation with universities and, most important; Touchstone engagements to validate, test and help to improve many different NFV-Infrastructures. Touchstone: VoerEir's SW product is a Test Suite Manager for OpenStack based NFV-Infrastructures. It controls execution of a wide range of Test Frameworks and Includes thousands of pre-integrated automated Test Cases. The Focus is on NFV-Infrastructure's performance KPI validation and testing for Performance optimization. Touchstone also Includes all test cases you need for NFVI and VIM; Functional validation, Robustness, Scalability and Stability testing. Transformation consulting to NFV in 8 Logical Steps (V8LS), to help organizations transform into an efficient way of working with NFV. From procurement all the way to Life Cycle Management. Education: Courses in NFV relevant technologies. 1 - 3 days training & work-shops which deep dives into technical topics of NFV transformation.